What is transshipment? Why does it matter? What have we learned and what remains unknown? Read on to find out. Vessels may meet at sea for a number of reasons, such as to refuel, to exchange crew, or to deliver supplies. 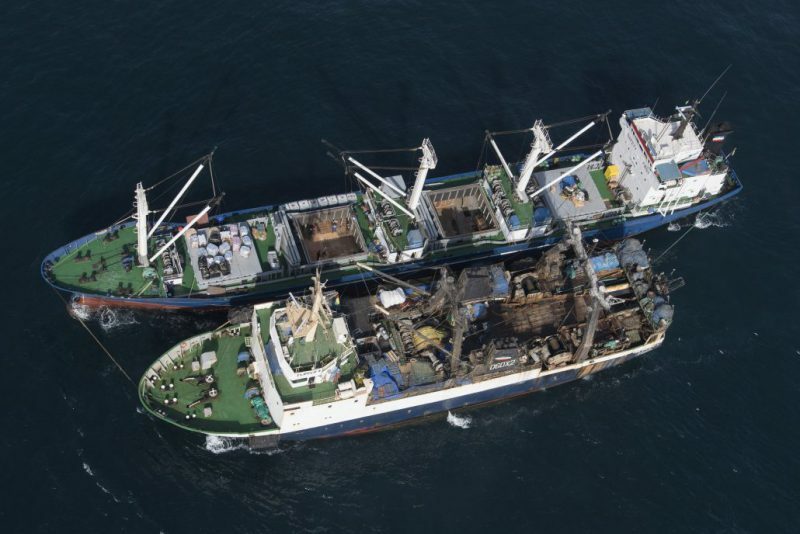 In the commercial fishing industry, vessels also meet to transfer catch in a process known as transshipment. Huge vessels with refrigerated holds – some large enough to hold over 100 US school buses – collect catch from multiple fishing boats at sea to carry back to port. By enabling fishing vessels to remain on the fishing grounds, transshipment reduces fuel costs and ensures faster delivery of catch to port. As a result, many vessels that fish in the high seas or in waters far from their home ports engage in the practice. Unfortunately, it also leaves the door open for mixing illegal catch with legitimate catch, drug smuggling, forced labor and human rights abuses. Fishing vessels can remain at sea for months or even years at a time, enabling captains to keep their crew at sea indefinitely and, in some cases, resulting in de facto slavery. As a pathway for illegal catch to enter the global market (an estimated $23.5 billion worth of fish annually worldwide is illegal, unreported and unregulated (IUU)), transshipment prevents an accurate measurement of the amount of marine life being taken from the sea. It obscures the seafood supply chain from hook to port and hobbles efforts to manage fisheries sustainably. Occurring far from shore and out of sight, transshipment activities have traditionally been hard to manage and relatively invisible. Data on transshipment has been virtually nonexistent, proprietary, and rarely shared publicly – until now. 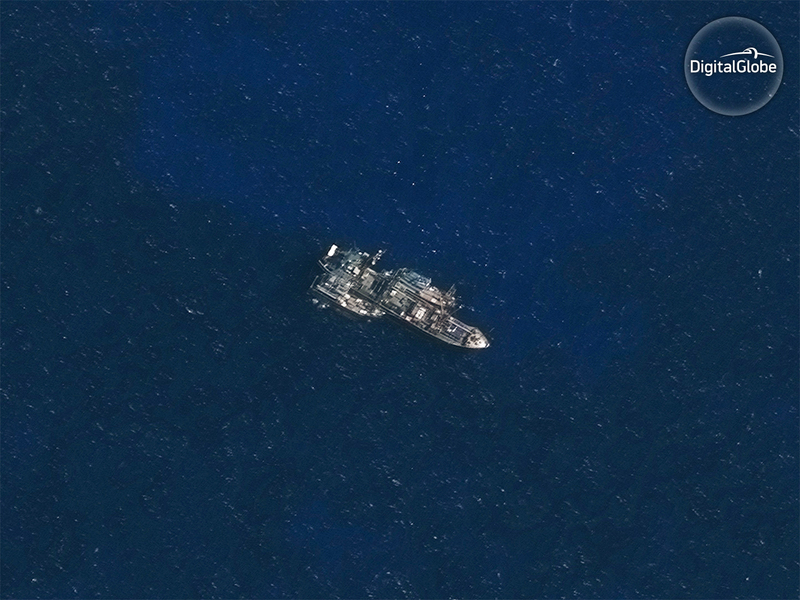 With generous support from the Walton Family Foundation, Global Fishing Watch and SkyTruth are applying machine learning and satellite data to study global transshipment patterns and shine a light on what has historically been an opaque practice. Previously, no public, global database of transshipment vessels existed. So, as a first step to understand global transshipment activity, we developed one, combining data from vessel registries, hard-nosed internet investigations, and applying machine learning techniques to identify potential transshipment vessels. This first public, carrier vessel database includes roughly 680 vessels, predominated by large vessels operating within Russian waters or the high seas tuna/squid fleets. 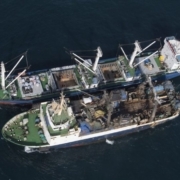 In the Indian Ocean, off the remote Saya de Malha bank, the refrigerated cargo vessel (reefer) Leelawadee was seen with two unidentified likely fishing vessels tied alongside. Image Captured by DigitalGlobe on Nov. 30, 2016. Credit: DigitalGlobe © 2017. Image by DigitalGlobe via SkyTruth. With databases of fishing and transshipment vessels sorted, the next challenge was to identify where these vessels met at sea. To do this, the team analyzed over 30 billion vessel tracking signals (Automatic Identification System (AIS) messages) to identify potential transshipment encounters. AIS is a collision avoidance system that transmits a vessel’s location at sea and these transmissions are collected by land and satellite-based receivers and delivered to Global Fishing Watch for automated processing. Nearly all large transshipment vessels carry AIS making it possible to identify all locations where they loiter at sea long enough to receive a transshipment, or locations where two vessels (a transshipment vessel and a fishing vessel) are in close proximity long enough to transfer catch, crew or supplies. Applying these two methods, we have presented the first open-source and global view of transshipment. We found that over half of transshipment behavior identified using AIS may occur in the high seas and these are generally associated with regions of reduced management and oversight. This lax oversight extends to the vessels involved in potential transshipments, with nearly half of the transshipment vessels we have identified registered to flags of convenience (countries with reduced oversight and limited connection to the vessel, if you’re interested this blog post has more details). As regulations for transshipment vary widely, the data alone do not suggest illegality, but reveal patterns and hotspots of activity, the vessels involved, and provides a new perspective which can further investigations around specific incidents and inform general policy discussions. Global Fishing Watch’s new encounters layer reveals for the first time where and when thousands of vessels are involved in close encounters at sea. We are only just beginning to see the true impact of this unprecedented dataset, but already it has been used to identify vessels potentially involved in catching sharks that were illegally transported through the Galapagos (described here) and in an upcoming scientific paper by research collaborators at Dalhousie University, identifying those fisheries that most heavily utilize transshipment. Our partner, Oceana also analyzed the data in their report that identified patterns of likely transshipping, top ports visited by these vessels and vessels at sea for more than 500 days. Additionally, our models have been incorporated into recent efforts to estimate the costs and profitability of high seas fishing (described here), a set of potential transshipments have been incorporated as a layer within the Global Fishing Watch public map (here) and our work has supported investigations into human right abuses within fishing fleets (Greenpeace, 2018). Our next steps involve extending these analyses to include “bunker” vessels which provide fuel to fishing vessels at sea, which along with transshipment vessels, play a critical role in supporting high seas, distant water fishing. Combining bunkering (refueling) and transshipment events, with vessel identities (owners/operators and flag states) and additional vessel events including port visits, we will identify the social network at sea. With generous support from the Walmart Foundation, over the coming years we will also explore transshipment in tuna fisheries, analysing and mapping activities that enable global tuna fleets to stay at sea for long periods without oversight. We hope this work will help global efforts to combat illegal and unsustainable tuna fishing. The publication of this unprecedented dataset provide the first view of the global patterns of transshipment and is the first step towards greater transparency in a previously difficult to track activity. By making the underlying data freely available it can be used by governments, NGOs and academia to support both regional and global efforts to strengthen monitoring and enforcement to eliminate IUU fishing.